Krilogy’s values of Abundance, Dedication and Leadership extend far beyond the walls of Krilogy. These values drive the team to their commitment to community service, helping those in need and offering their time and talent to a number of organizations. Did you know that Krilogy team members serve on more than 60 boards and committees across the St. Louis region, and volunteer, on average, 15 hours per month per team member? This dedication to service has continued throughout 2018. The following events highlight causes the team recently supported. This year’s Krilogy Cares partner, Dueling for Lincoln, recently held their annual fundraiser featuring dueling pianos and other forms of entertainment. The Krilogy team came out in full force to support the event. Team member Matt Mercer and his wife Kelsey founded the organization after losing their son, Lincoln, to Noonan’s Syndrome at 2-1/2 months of age. 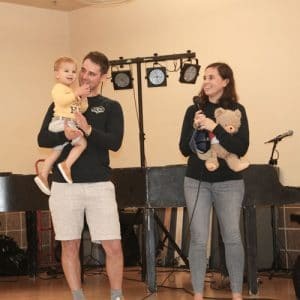 Dueling for Lincoln raises funds to further research of Noonan’s Syndrome, congenital heart disease, and Juvenile Myelomonocytic Leukemia (JMML), and provide financial support to families coping with these traumatic diseases. The organization has been the focus of Krilogy’s philanthropy for 2018, with ongoing efforts throughout the year to support the cause, including a 5k race this past spring to raise money and awareness.